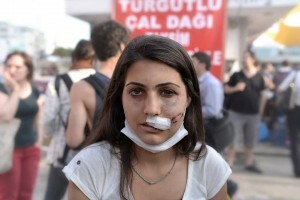 I was walking around Gezi Park when I bumped into this woman. She was sitting quietly. It was not difficult to guess what had happened to her but I wanted to ask her the story. She said that the police had targeted her face. Her teeth are broken and she has some fractures on her jaw. Yet, she is calm and she does not appear angry. She is still receiving treatment. I asked her if I could take her photo and I told her that people should see what had happened to her. She was a little embarrassed. I felt so sad and angry that my hands started to tremble and I could hardly take this photo. Meet Hulya, she is still beautiful.